What does it mean when an answer is "accepted"? in Help Center. Probably it will do no harm to mention it also here - maybe this will make it easier to find for some users. If your post has at least one answer, you should see a checkmark next to it. If you hover over it, you should also see a tooltip: "Click to accept this answer because it solved your problem or was the most helpful in finding your solution (click again to undo)." As the tooltip says, by clicking on the checkmark you accept the answer, which makes the checkmark green. 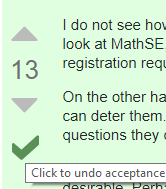 Also the background color of accepted answer is different from other answer. 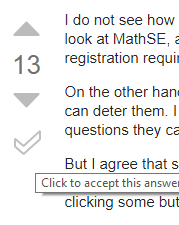 If you hover over the checkmark again, you can see the tooltip saying: "Click to undo acceptance of this answer." If you decide to unaccept the answer, you can do som simply by clicking again on the green checkmark. Links to more information about accepted answers can be found in the tag-info.